Smits & Co.w Gone Goatee & Old Abbey Ales Belgian Quad: In this pairing I feature two products from two producers in the neighbouring towns of Abbotsford and Chilliwack in British Columbia. It is incredible to see the growth in the outskirts of Greater Vancouver in farming towns such as these ones, each worthy of a local food tour and home to many high quality breweries now. They produce some fantastic dairy products, produce and beverages in this region, much of which I have sampled over the years. I chose an aged plain goat cheese from a nearby cheese maker to go with this beer, since Belgian Strong Ales like Belgian Quads tend to be a bit powerful, I wanted to pair them with a cheese that is fairly potent. 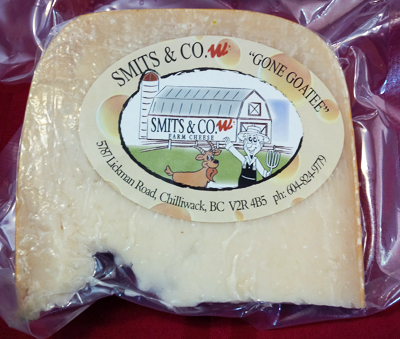 Overview of the BC Cheese Makers and Brewers: Located on a diary farm, Smits & Co.w Farm Cheese is a family operated cheese making company with a small on-site store and herds of both cows and goats that are milked to make their cheeses. They just celebrated their 5th anniversary in June, recently making their 500th batch of cheese, and they make all kinds of flavoured cheeses throughout the year to keep it interesting (pumpkin seed nutmeg is on my list now!). 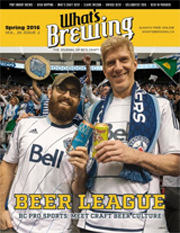 The beer is brewed by a newly opened brewery in Abbotsford called Old Abbey Ales who are focused on making real, bottle conditioned ales with some Belgian and Abbey flair to them. 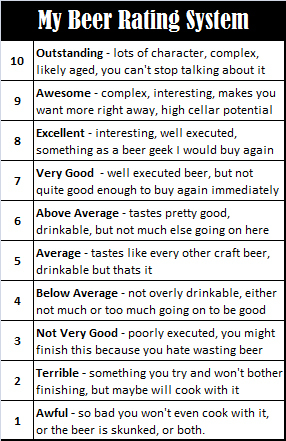 I have yet to visit the brewery, but many people I talk to have insisted on stopping in for a visit due to the quality of the beer, the variety of their experimental offerings and the crazy amount of beers they often have on tap. 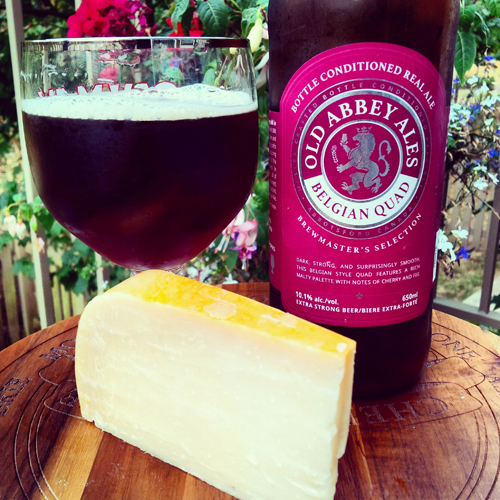 The Beer: The Belgian Quad by Old Abbey Ales clocks in at 10.1% alcohol by volume with 27 IBUs worth of hops and is available commercially in 650mL re-fermented bottles in most private liquor stores. It features a fruity aroma of cherries, figs and plums with quaffs of toffee, brown sugar, licorice and booze on the side. The flavour is similar to the aroma, starting off with toffee, cherry and plum up front with black licorice, earth and booze in the middle and finishing with hints of leather and spicy cloves. All around it is a fairly malt forward, good quality beer that I plan to purchase again. The Cheese: Gone Goatee by Smits & Co.w is an aged Gouda style goat cheese with a thick crunchy rind and a semi-hard texture. Its aromatics include nuts, earth, broth and hints of yogurt while its flavour profile expands into pasty walnuts, crackers, potent broth and earth with subtle plain yogurt and leeks on the side. This is a pretty interesting cheese, it’s balanced and flavourful, with a nice nutty and earthy overlay that gives it some distinction and potency. I’ll be looking for more varieties soon! The Pairing: I found that the cheese was a huge winner in this pairing as it revealed some major hidden flavours when paired with the beer. I got new notes of honey, almonds and biscuit while the broth and salt grew into a crave worthy deliciousness. The beer balanced out a little bit, highlighting and enhancing the stone fruit while muting some of the earthy bitterness and balancing out the booze; having a similar effect to storing it for a year in the cellar. Overall Rating: Excellent at 8/10, an excellent cheese pairing with a quality beer. Here’s a link to their Facebook Page where you can stay up to date on their events and releases. Just look at this delicious Fall cheese, I have to get my hands on some of this in September!